Maybe we should all be a little more like this guy in 2013. I was involved in a car accident earlier this year. Found this tucked under my windshield wiper blade when I returned to my car this evening. Pic via imgur. Can't see the image? Click here. 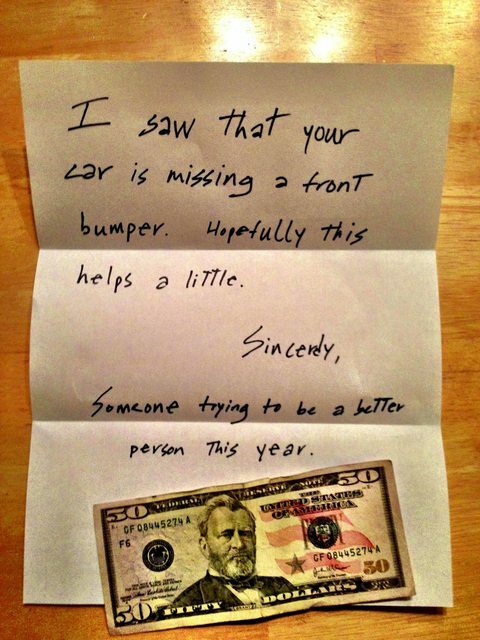 Email “Heartwarming New Year’s Resolution Pic of the Day”. Feedback on “Heartwarming New Year’s Resolution Pic of the Day”.